The City Council Meeting for Monday December 9th, 2013 originally had 4 resolutions related to minor league baseball on the regular agenda. The text for all 4 ordinances is at the bottom of this article. At printing time of the agenda, around 3pm, all 4 resolutions were either withdrawn or continued to the City Council Meeting on Monday January 27th, 2014 (Ordinances 2013-222 and 2013-R255). However, at the meeting, Ordinances 2013-221 and 2013-223 were brought up to be voted on. These ordinances are not directly connected to Mayor Jones’ Shockoe Bottom Baseball Plan, but it is pretty transparent that they are related. In fact, Mayor Jones was the patron of all four ordinances. Byron Marshall the Chief Administrative Officer for the City presented the two ordinances. Marshall used careful language to paint a picture of necessity, and inevitability of the end of baseball on the Boulevard. The gist of the ordinances is that the City of Richmond wants to reclaim the properties associated with the baseball Diamond on the Boulevard from the Richmond Metropolitan Authority (RMA). Marshall suggested that the content of these ordinances was such that the City of Richmond would only have the properties reverted into their ownership if or when (he used the word when, I use the word if) baseball was no longer being played on that property. However, the text of the ordinances as presented in the agenda does not contain information about timing or conditions of the property changing hands. It seemed that members of Council had not been presented with all of the legal documents surrounding these ordinances, and several members, including 3rd District Representative Chris Hilbert voiced concerns about not having all the information. A public comment period was held, where around 15 folks spoke in opposition of these ordinances and in opposition of the City Council voting on the ordinances during that meeting. It was brought up that a series of public meetings were being held to gain public input about Mayor Jones’ baseball stadium development plan, and since these ordinances are connected to that plan, the Council ought not vote on them without input from their constituents. People also brought up that there is no urgency to these ordinances, and that the pushiness of the administration to get them passed was suspicious and irresponsible. The people who spoke and held signs in opposition represented a diverse group of Richmonders, residents of potentially affected neighborhoods, and included members of many organization including the NAACP, RePHRAME, Collective X, Virginia Defenders of Freedom Justice and Equality, Wingnut Anarchist Collective, Alliance for Progressive Values, and more. The push to pass these two ordinances fell in line with the rest of Mayor Jones’ strategy around the Shockoe Bottom development. That strategy being to push for the development as if it were a done deal that had already been consented on. 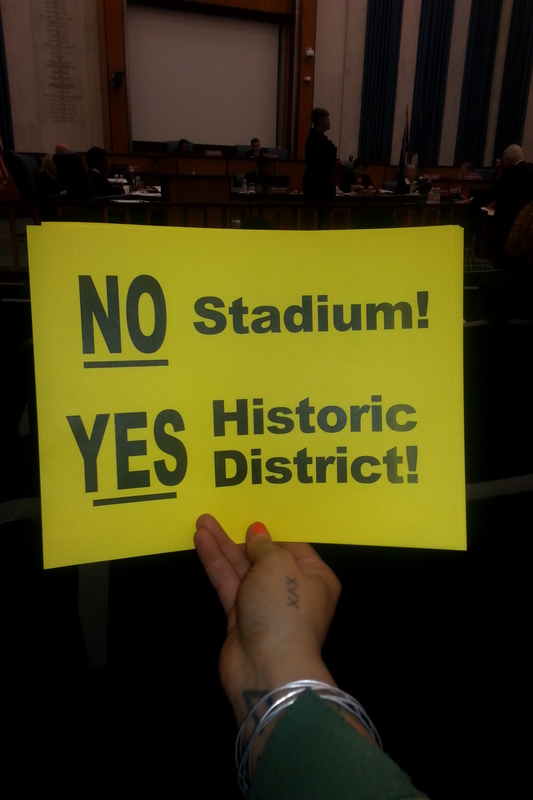 The fact of the matter is that the people of Richmond when polled are against a stadium in Shockoe Bottom. The development and decisions are not finalized, and there is still plenty of opportunity to prevent a stadium in Shockoe Bottom. There was only 1 person who spoke in favor of City Council voting on the two ordinances at the meeting. City Council President Charles Samuels (2nd District) explained that some Council members had wanted to push for these ordinances to be voted on at the December meeting, out of fear that during the General Assembly starting in January, some law would be passed which might hurt the City of Richmond’s ability to regain control over the RMA managed Boulevard properties. Samuels stated that he personally had no problems with the ordinances, but had wanted to have them continued to give the public better participation. Chris Hilbert made a motion to continue the ordinances until January 13th (other Shockoe Development ordinances have been continued to January 27th). Reva Trammell ( 8th District) seconded Hilbert’s motion. Parker Agelasto (5th District) suggested that the language in 2013-223 be altered to include the timing and conditions mentioned by CAO Marshall. Council then voted unanimously to continue the two ordinances until January 13th.